Noah’s Raven, a political thriller by retired Vancouver criminal lawyer Bruce Fraser, imagines the intersection of the American electoral process with First Nations’ land rights. This new novel explores the mysteries of the vast canvas of the rugged Chilcotin region of BC. Hanlon’s attempts to preserve his ancient ancestral homeland are challenged by the outside interests personified in Northrop and O’Connor. These opportunistic Americans threaten to conquer the pristine wilderness of the Chilcotin with a development that will irrevocably scar the land. The region may change forever — as will history — if Hanlon can’t overcome personal tragedy to fight for the land he loves. Author Bruce Fraser won silver in the 2010 eLit Book Awards and has received awards for his short stories. The Founding President of Access Pro Bono, Fraser practiced as a trial lawyer in the Interior of British Columbia and Vancouver through his 45-year career, representing First Nations peoples in Aboriginal Rights cases, as well as civil and criminal proceedings. He currently maintains a residence at Lac La Hache. 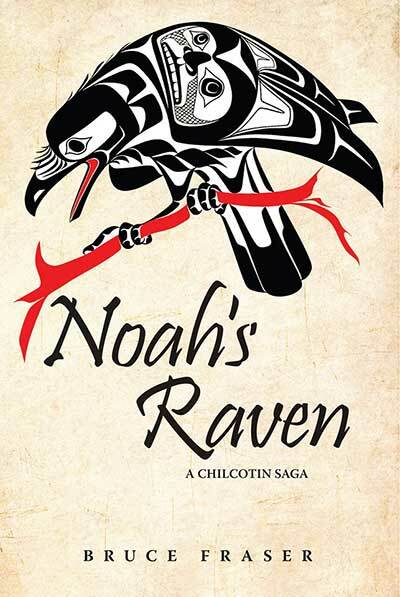 Noah’s Raven is Fraser’s third novel set in the Chilcotin. The recent damage to the region from wildfires spurred the donation of 10% of profits and author royalties from the book to wildlife recovery and preparedness programs.